PROJECT DESCRIPTION: Kitchen remodel - removal of wall; structural repairs & modifications; all new floor plan, plumbing, electrical & lighting; vaulted ceiling, arch window, custom countertops, tiling and backsplash, Mexican tile flooring. DETAILS: Careful planning, rather than a costly addition, yielded the kitchen of the clients' dreams. The owners of this house are accomplished cooks, but their kitchen was small, dark and limiting. They had settled on building a kitchen addition. As we worked through the costing with them, though, it became clear that their plan for an addition, in tandem with their hopes for fine, quality products, was not possible given their budget. Although the homeowners were convinced that the kitchen they wanted was not possible without an addition, we thought otherwise. We promised to deliver their dream kitchen without building an addition. First we reviewed their wish list. It included a peninsula, custom tiled countertop and backsplash, built-in microwave, new electric range, pantry storage, enclosed laundry area, TV, phone and computer area, and twice as much storage and counter space. All this had to fit an elegant, functional, open, bright eat-in kitchen that would encourage interaction when the homeowners were entertaining. It was a lot to ask for within the existing 11 by 12-foot space. We set about expanding the room, physically and visually, by removing the partition wall between the kitchen and the dining room. Part of the ceiling in the dining area was raised, providing space for the new arch window, expanding the room further. Opening up the room still more, we also enlarged the doorway leading to the living room. By placing the kitchen's large masses - the pantry, the refrigerator and the stack-up washer and dryer unit, against one wall, and then filling in the space in between them with more cabinets, we created a singled clean plane rather than a collection of bulky appliances that could dwarf the rest of the kitchen. 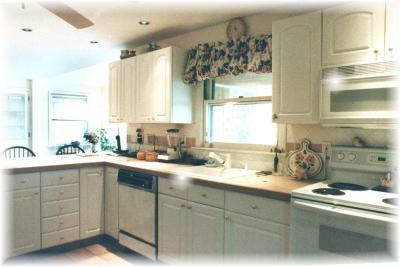 CLIENT COMMENTS [summary]: ...[the kitchen] exceeds our expectations. Your helpful suggestions and advice added a great deal to the success... the tile design and installation is truly a work of art. 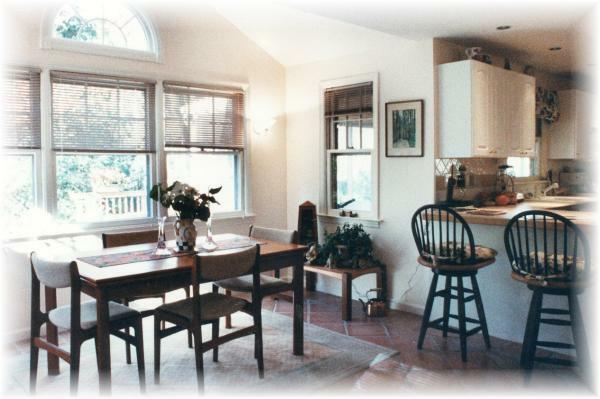 I would heartily recommend Absolute Remodeling to our friends and family, and, in fact, already have." - Dan & Paulette Sladkus, Yorktown Heights, September 1994.